"This is a great way to barbecue salmon for gatherings. It adds some superficial flavor without hiding the salmons' own great taste." 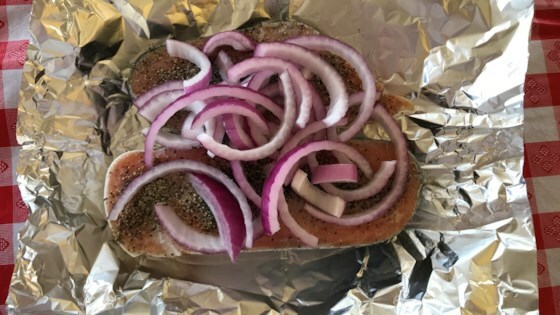 Place the salmon on a large sheet of aluminum foil. Place the onion rings on top of the filet. Pepper to taste. Wrap the foil around the salmon, but don't seal the top. Place the salmon (still in foil) onto a preheated grill and cover. Cook for 15 minutes or until salmon flakes easily with a fork. Oven broiled salmon fillets with sweet Dijon mustard sauce. This was a very bland dish.There are many delicious and easy recipes for salmon on this website. This is the first time I have truly enjoyed salmon. It was delicious! I definately recommend this very basic recipe.